BOUND/LESS, opening at 222 Bowery on Tuesday, February 12th from 6-8 pm, features a selection of artists presented by Arcilesi|Homberg Fine Art. For one night only, artworks contemplating the many facets of love and its endless scope will be presented, alongside music, wearable art and refreshments on the Bowery right across the street from the New Museum. Works by Vincent Arcilesi, Eileen Coyne, Maria Dimanshtein, Jun’Ichiro Ishida, Carolyn Oberst, Arlene Rush, Margaret Withers and more populate the historic space. From the gestural figurative to the geometric abstract, love in all its forms is present for visitors to explore. The show features a plethora of artists brought together to honor love in all its splendor. Featuring a majority women artists in this exciting group exhibit, don’t miss the only chance to witness all this magnificent, loved-themed art in one space! 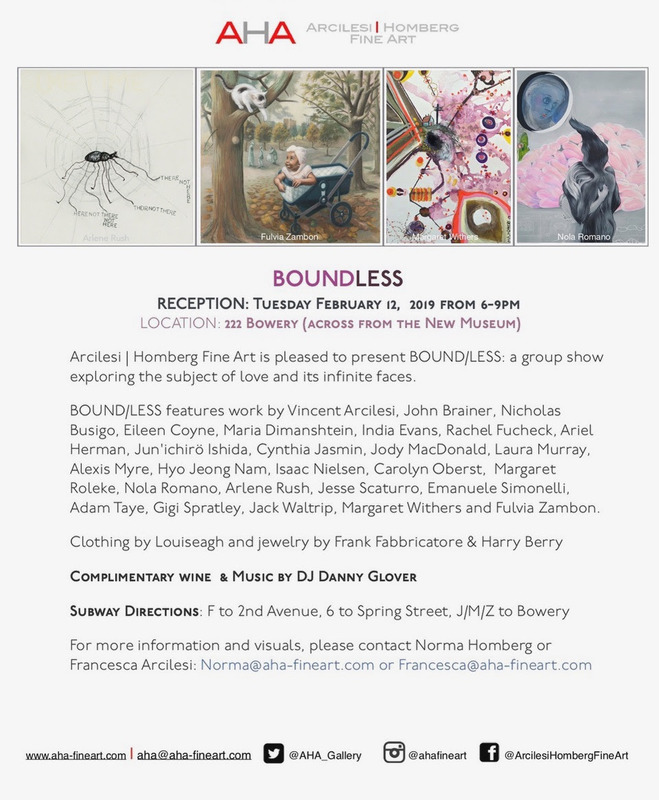 BOUND/LESS takes place from 6-8 pm at 222 Bowery on Tuesday, Feb 12th produced by AHA Fine Art.